There are several types of extension and variations upon those, many of which would not readily spring to mind. While loft conversions and conservatories are commonplace you may also be able to add a basement at the other end of a property or an orangery instead of a conservatory. 1 Perhaps the most common extension is a one that may or may not alter the main design of the building. Adding roof space can be the least expensive way of increasing floor space and value to a property. a) A volume allowance of 40 cubic metres additional roof space for terraced houses. b) A volume allowance of 50 cubic metres additional roof space for detached and semi-detached houses. c) No extension can be beyond the plane of the existing roof slope of the principal elevation that fronts the highway. d) No extension can be higher than the highest part of the roof. e) Materials are to be similar in appearance to the existing house. f) No verandas, balconies or raised platforms are allowed. g) Side-facing windows are to be obscure-glazed and any opening is to be 1.7m above the floor. h) Roof extensions are not permitted development in designated areas. i) Roof extensions, apart from hip to gable examples are to be set back, as far as practicable and at least 20cm from the original eaves. j) It should be noted that some roofs are more difficult to convert than others, so there won’t be a reliable source for estimating the costs involved in your conversion. Modern roof trusses often rely on the main external walls for support and are shaped to support the roof with angled timber. It may be that trusses will have to be altered to allow for a loft conversion. Planning requires two metres over stairs, so although there is no building regulation that covers roof height, once insulation and suitable floor joists are added some roofs are not high enough to make conversion a viable proposition. 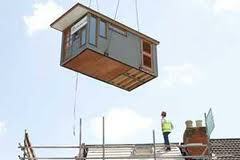 3 There are generally four types of Loft Conversion. i) Rooflight Conversion - ordinarily referred to as a Velux Conversion after the most well known manufacturer of flush to roof line windows. As the roof line will remain unaltered it is the least likely option to require planning permission. This also makes it the cheapest, ii) Dormer Conversion - An extension to the existing roof that projects vertically while creating additional floor space and head room. This is the most common type of loft conversion, iii) Hip to Gable Conversions - can usually increase the volume of small roof spaces. The process involves altering the sloped side (hipped) to a flat gable end, iv) Mansard Conversions - will be at the rear of the property on roofs with 72 degree pitches. Windows will be housed within dormers. As the process requires significant change to the roof, planning permission will be required.